The Hunzans are a mountain culture in northern Pakistan known for their unusual good health and long life – many of them living to be more than 100 years old. The Hunza Valley is very fertile and the remoteness of the land has protected them from the use of pesticides and other chemicals. The Hunzans are exceptional mountaineers and they are obviously very active. Their terracing, irrigation and fertilization techniques have left the land more fertile than it was 2,000 years ago. They grow and consume a wide variety of fruit and consume large quantities of whole grains including millet, wheat, barley and buckwheat. Their diet also includes spinach, mustard greens, root vegetables, squash, lentils, chickpeas and other beans. Almost everything they consume is raw. 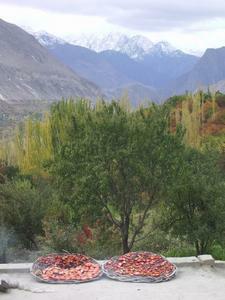 Sun-drying fruit in the Hunza Valley for the winter months ahead. Such evidence of the effect of exercise and a diet that is in harmony with environmental and physiological needs provides motivation for me to maintain a healthy work/diet/environmental balance for my equine partners. Our trip to Death Valley Encounter this year was not quite what we had hoped for. 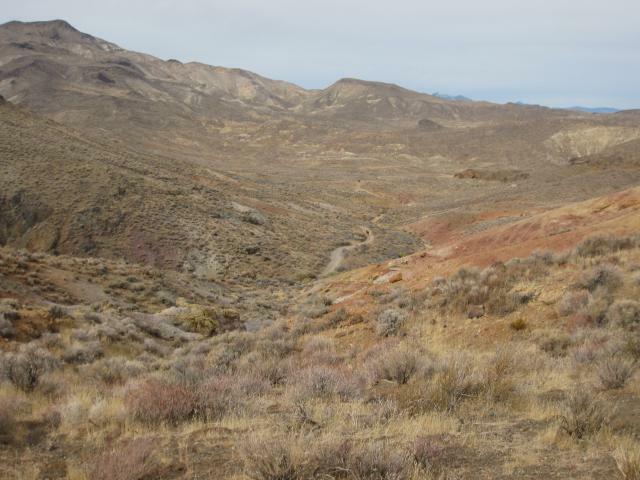 Rusty’s horse Rocky spooked and bolted at the ten mile mark on Day One, unseating Rusty and causing the saddle to twist under the horse and send him bucking, riderless, into the desert. Rusty had to track the horse to find him while I went on to get help at the vet check. The Duck set off across country immediately to find them. Rocky would eventually be found with his right hind leg through the stirrup – all the way over his stifle. All four legs were bruised and cut from his experience – and the vet was worried he had torn a check ligament in a front leg. I went on to finish Day One on Far, but we decided to take Rocky back to Arizona to get him to a vet clinic to see how bad the damage was. 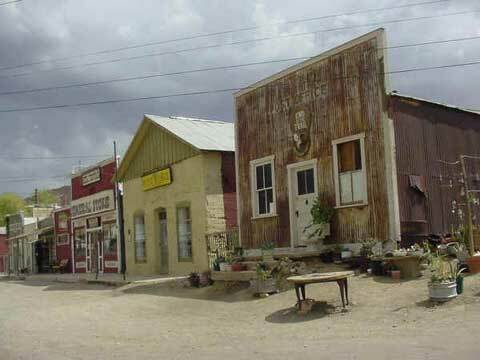 We got to ride through the unforgettable town of Randsburg. The news is good: the ultrasound revealed the wounds are mostly all surface and there are no tears or strains to any of the tendons or ligaments. He is in stall rest for while and can go back to light work in a week. 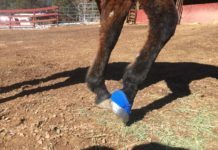 That horse was really bucking through all the commotion – and he did not even lose a boot: I was shocked the boots stayed on. 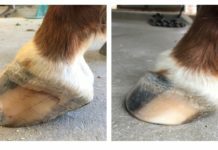 Far and Rocky both rode in Easyboot Glue-Ons. I really think they are the best product for multi-day rides. I doubt Rocky’s desert ordeal will compromise his long-term health. In the meantime, I suggest you continue to evaluate the combined effects on your horse of diet, exercise and environment. I do think that the relatively good outcome of this incident is because Rocky is stronger and healthier than he has ever been – all as a result of thinking differently about the way we manage this horse through natural horse care. 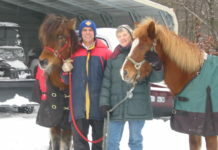 I’m happy to report that all our barefoot horses continue to be sound and happy. Some of our winter guests and neighbors have arrived for their doses of winter sun, and the horse population in our corner of the Sonoran desert has increased from five to 17. 14 of them will be barefoot by tomorrow. Far is the little dot on the road – we went on to have a great ride! We’ll put Death Valley Encounter back on our calendar for next year: it really is one of the most beautiful rides I’ve ever been to. There is no better way to ring in the New Year. Next articleHow do I choose a Trimming Method?